Development of human resources in the field of information and communication technologies is one of the priorities of the Azerbaijani Education Ministry, Deputy Education Minister Firudin Gurbanov said at a conference organized on the occasion of the Information Society Day on May 17. Gurbanov said that the ICT sector development is priority direction for the state, adding that important state programs approved in Azerbaijan, which ensure the ICT development, prove this. The issues of increasing staff potential and training qualified specialists in the ICT sector in line with today's requirements were assigned to the Azerbaijani Education Ministry, according to him. 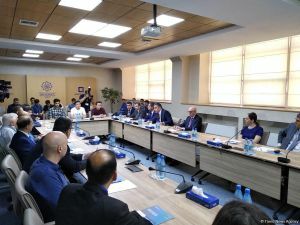 "Therefore, informatics lessons are being taught in all secondary schools, and students are trained in a number of specialties in the IT field at higher education institutions, " Gurbanov said. According to him, various kinds of intellectual contests and Olympiads, which are also priority areas for the ministry, play an important role in improving skills and knowledge among young people. "Young people demonstrate brilliant results in competitions and Olympiads, which is useful for their future development and advancement. The studies show that those, who participate in intellectual contests and Olympiads can improve their skills by 35-40 percent, "Gurbanov said.